Kitten with a Whisk: My black thumb strikes again! I was lucky enough to inherit a lot of great qualities from both of my parents, but their green thumb was definitely not one of them. It’s pretty much a give in that I will eventually kill any plant I’m put in charge of. I can’t even keep those little “lucky bamboo” plants alive longer than a month or so. I have no idea why I seem to have such a honker of a black thumb, but I figure I can’t excel at everything in life and accept it as a small flaw and then go eat some ice cream. Still, every year I am so jealous of people who can plant a little garden and get beautiful veggies and herbs by summer’s end. This year I decided to give herbs a try and I was met with some success. 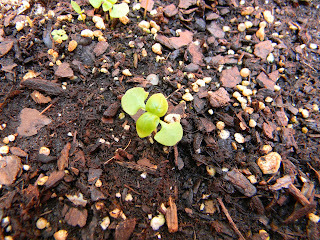 I planted basil, cilantro, parsley, chives, dill, and oregano. What I ended up with is a lot of weeds, a sprout of dill, a little tiny bit of cilantro, the start of some parsley and more basil than I know what to do with at this point. 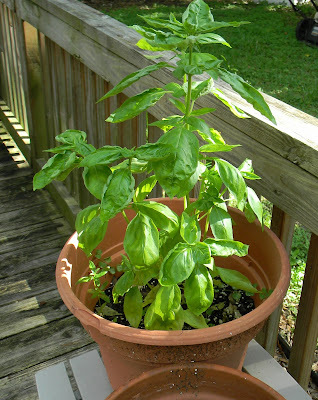 The basil has pretty much become a monster plant. Surprisingly Brent knows more about growing herbs than I knew he did, and has helped me out a wee bit. But then he keeps saying we should give some of the basil away and I’m thinking not. I grew something! From a seed. It’s like my baby and there is no way someone else is going to reap the benefits of my diligent watering everyday. Especially since everything else was pretty much a bust. This picture was about two weeks ago and it has gotten even bigger! So I’ve been dreaming up as many ways to use the basil as possible. 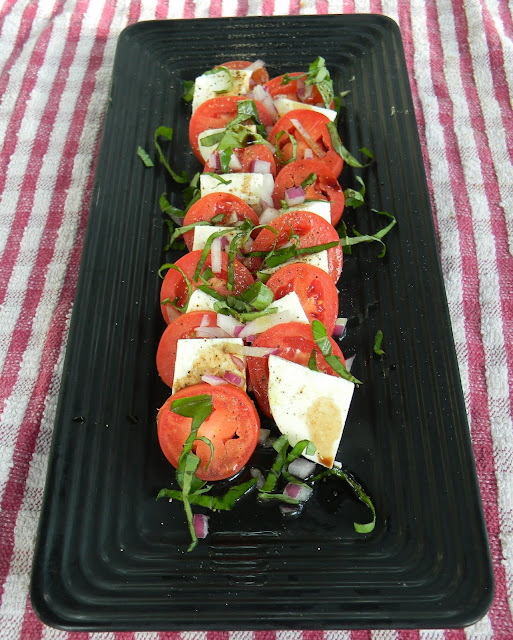 One dish I knew without a doubt I was going to make once I could pillage some leaves was a caprese salad. 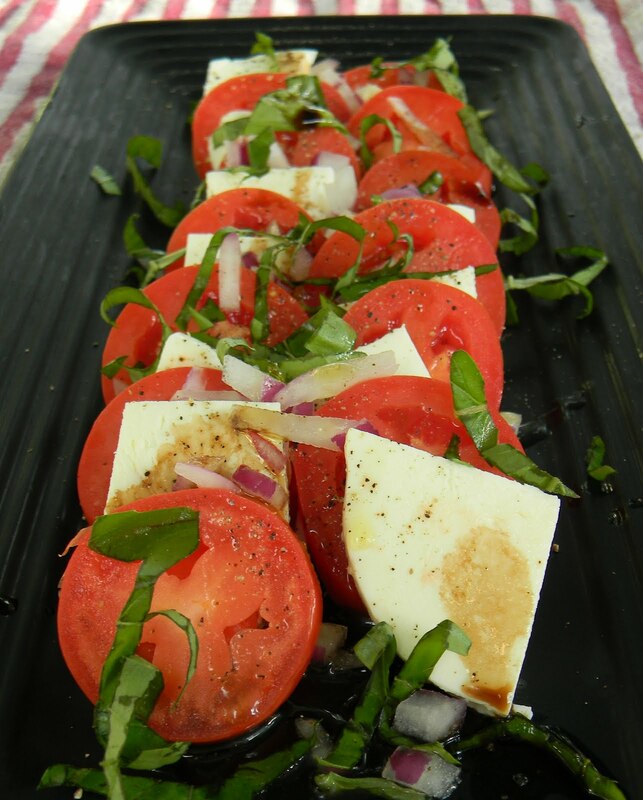 For me the caprese salad screams summertime with fresh ripe tomatoes, sweet mozzarella, and bright basil. It’s an absolutely perfect salad and I could probably eat it everyday if given the chance. While the last thing the world needs is another recipe for such a simple salad, I figured I’d share the basic idea here because just posting my failed attempt at growing herbs isn’t all that exciting. And I’ve come realize that I do one thing that most people do not… I add some red onion. Is that weird? I just like the contrast of flavor it has against the other ingredients. Don’t use too much though or it will overpower everything else. On the day I went to pick up the tomatoes, the larger vine-ripened and beefsteaks weren’t looking so hot. They were kinda pale and not a juicy red color, so I went with roma that day. Use any kind you prefer. *Serves how ever many you want! - Evenly slice your tomatoes and mozzarella to be about the same size. Generally I use about 25% less mozzarella than I will tomato. Layer on a plate. - If doing larger slices of tomato and mozzarella, thinly slice red onion, or mince red onion if using smaller, bite-sized portions. As a general rule, I will only use about the same amount of red onion as I will basil. Layer in or on top of salad. - Tear or mince basil. You can leave it whole as well and layer in-between the mozzarella and tomatoes. - Season with salt and pepper, than lightly drizzle with olive oil and balsamic vinegar. If you can find burrata somewhere nearby (try a cheese store), you can make a caprese worthy of the gods. Kudos on your herbs!!! This is my favorite Summer salad; there are so many great ways to put a fun spin on the classic preparation, and red onion makes for great flavor contrast. I have been enjoying tomatoes so much this year, and a Caprese salad is one of the best ways to eat them!